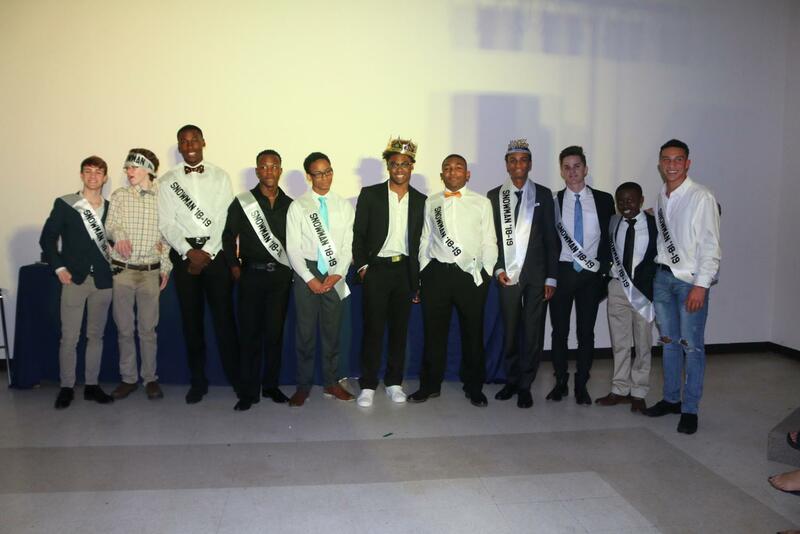 The snow was falling outside, and the lights were shining on the stars of the night as the boys lined up on the stage… introducing the SA Snowmen Court, composed of several young men ranging from the freshmen to senior classes, each having been voted to the court by their peers! All the students patiently waited all night to find out which of their friends were chosen as our first ever snowcoming king! The homecoming court has been a long-standing tradition at St. Andrew’s, and many thought it would be fun to share the spotlight with a group of elected boys for the New Year’s Eve in New York winter dance. The homecoming maids and their escorts are always introduced with a short biography when they walk around the gym and field, so it is only fair for some of the Snowmen to also have similar questions to answer. The student council played a pivotal role to make sure that this court could happen this school year. The freshman Snowmen are Dami Oluwatade and Cooper Word; the sophomore Snowmen are Byron Bishop, Dallas Ford, and Rand Raju; the junior Snowmen are Aaron Cooper, Arness Georgetown, Sameer Khan, and Hayes Waycaster; and the senior Snowmen are Charley Blount, Bradley Brantley, David Caddle, Ian Espy, and AJ Leflore. Charley- My favorite high school memory was watching Jack Ferguson and Luis Arceo eat four large cheese pizzas in one sitting earlier this year. Hayes- Some of my favorite high school memories are running around China with Alisa and Cole and winning an individual state championship with anna last year. Byron- Some of my favorite memories include creating the Popsocket chain for the first time and just seeing everyone’s reactions to it and how much it still makes people smile. Cooper- My favorite memory was Mason Kimball. How do you feel about being elected to the first ever Snowmen court? Charley- Happy. I’m glad snoco court is a thing because I believe women and men should have equal opportunities. Hayes- I think it’s exciting that there’s a boy court now because we have never had the chance to get all the attention. Byron- I’m truly honored and so happy that this was able to happen and hope that I can help to provide an example for years later. Cooper- It’s a great honor, and I’m very grateful for being elected. Charley- I like to play Fantasy Football and baseball; eat Canes and McDonalds with Jack Ferguson and Luis Arceo; hang out with my pals: Hamza, Luis, Jack, Johnny Bethea, and Reed Hooks at Speech and Debate tournaments on the weekends; and lift weights with Trey Ellison and Holland Townes. Hayes- I enjoy driving around and gossiping with anna, late night phone calls with Alix, and sleeping. Byron- I like playing Sims 4, spending time with friends, yoga and stretching in general. Cooper- I like photography, playing sports, reading, and playing video games. How long have you been at SA? What sports and clubs are you a part of? Charley- I am the Student Body Vice President, Exploring Jackson Through Food Club President, Three-year letterman on the Saint Andrew’s baseball team, member of the Saint Andrew’s Soccer team, member of the speech and debate team, and Member of Chapel Council. Hayes- I am president of the mandarin club and LGBT+ student union, a member of varsity tennis since 8thgrade, high honor roll, and a member of NHS. Byron- I am in Film Club, Latin Club, Girls’ Empowerment Club, and archery. Cooper- I play football and baseball.